Egg flies have worked well on reservoirs and lakes for Trout. 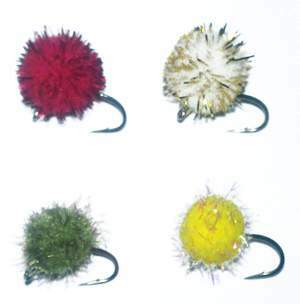 Simply Glue the No Tie Egg Fly Crystals to the hook. The lurex and tinsel just adds that extra sparkle and interest to the fly. Either use floatant or retrieve and stop, be prepared as trout love these. Crystal egg flies are the first development on the egg flies for many years. Using the latest materials with lurex and tinsel we have managed to enhance the egg fly with the lurex or tinsels giving that extra edge to the egg fly for reservoirs and lakes. Although not a natural food stuff for for our lake fish their predatory instincts come to the forefront when they see these little beauties. We have caught fish with these static and with retrieve and pause techniques.